Today I think I'll tackle one category I know pretty well (I saw 'em all... even if there are only three nominees) and one category I am ashamed to admit I know absolutely nothing about. That's right, folks -- even your great Oscars swami can't be in every movie theater at once. More yoga, maybe? Hmm. But we'll get back to that subject later. (No, not the yoga.) First let's discuss the feature-length cartoons, shall we? Who will win:I suppose the Academy might want to give the award to Corpse Bride. After all, this is the first time Tim Burton has been nominated for an Oscar. You read that right. Oh, Ed Wood received 2 awards in 1994 (for makeup & best supporting actor Martin Landau as Bela Lugosi). Then again, Burton's 1993 stop-motion feature, The Nightmare Before Christmas, wasn't even nominated; it made it into the visual effects category for some reason never made clear. The Academy might believe Burton was robbed and it's time for his reward. But my bet is on the Wallace & Gromit feature, although I can't put my finger on why I feel that way except that the Academy really likes the series. Wallace & Gromit shorts received Oscars in 1993 and 1995 (for The Wrong Trousers and A Close Shave; animator Nick Park also won for the 1990 Aardman claymation extravaganza Creature Comforts). It also took home the Annie Award -- bestowed by the International Animated Film Society -- for best feature, against the same nominees. So I'm going with my gut. Who should win: I suppose if Corpse Bride and Wallace & Gromit split the votes, as I illustrated above, my favorite animated film -- Howl's Moving Castle by anime guru Hayao Miyazaki -- might have a chance. The story is whimsical and out there: a teenaged girl meets a mysterious wizard named Howl arousing the jealousy of the wicked Witch of the Wastes, who turns her into an old woman; the girl leaves her village and takes refuge in wizard Howl's magical moving castle. 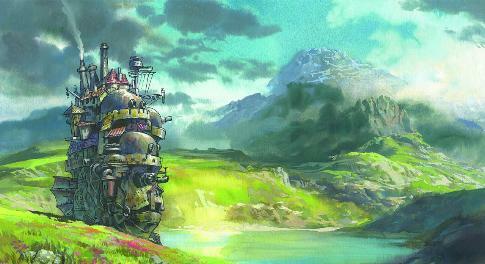 It's adapted from a fantasy novel by Diana Wynne Jones, and while fans of the book might not have liked how much the film strayed from its source material, I loved the Miyazaki touches.... like blobby monsters, quirky machines, and a pervasive anti-war subplot. But because his 2002 film Spirited Away "just" won an Oscar, Howl hasn't got a chance in hell. Who was robbed: The only other animated feature I saw in 2005 was Robots, and I think it would have received a nomination if it hadn't been released so early in the year. Who will win: So we've come to the major category where I haven't seen a single nominated film. I should be ashamed, but only Paradise Now has been released locally; that was back in November, and I just wasn't in the mood for a flick about suicide bombers right before Thanksgiving. All of the others are either in limited release or haven't been released in the US yet, but they are on the Landmark Theaters list so should be here soon. I'm really not against subtitles -- I did see other foreign films last year, just not any of the nominees. So, how do we make a prediction in a category where we have absolutely no opinion? Let me re-direct you to my favorite webpage this time of year, the AMPAS Oscars Nominees list, which provides film synopses for even the shortest short. Many's the foreign film winnner I've chosen by its synopsis alone. Let's begin with Don't Tell, a personal film about an actress who's repressed memories of being molested by her father. Topical, but not the type of film the Academy tends to reward. Also topical -- but no cigar, I think, even though it won the Golden Globe -- Tsotsi looks like a feel-good film about a street thug's journey to redemption. Moving on. The remaining 3 movies tackle a subject the Academy is very fond of: war. Joyeux Noel takes place on Christmas Eve, 1914, as French, German and Scottish soldiers lay down their rifles and bring peace to "No Man's Land" by... singing. Hmm. Hasn't there already been a film called No Man's Land? It was about Bosnia and Herzegovina and UN Peacekeepers, and it won the 2001 Foreign Film Oscar. (Buzzer sound.) Next! Sophie Scholl... takes place during the next World War, and is based on unpublished transcripts of the interrogation -- and subsequent execution -- of a 21-year-old girl arrested for her participation in a Nazi resistance group. Hmmm. (Tapping chin thoughtfully.) An anti-Nazi film from Germany? Getting closer, but do we really need to re-examine these politics? (Buzzer sound.) That leaves us with Paradise Now, the one about the suicide bombers that I couldn't deal with at Turkey-time. The film follows two young men as they're contacted by the guerrilla group to which they both belong; over the course of 27 hours they begin the process of taking leave of their families and friends. Let's see: timely, political, slightly controversial... and it won the Critics' Choice award. (Ding! Ding! Ding!) I think we have a winner in Paradise Now. Who should win: I clearly have no personal opinion, so I think I'll beg off this question and leave that to your own taste. Instead I'll use this space to berate the Academy for its antiquated "Official Country Nominee" practice. Honestly, Deuce Bigalow: European Gigalo and Son of the Mask are both on the "List of Eligible Releases for Distinguished Achievement," but Hong Kong only gets to submit Perhaps Love? (With Takeshi Kaneshiro, pant-pant!) I'm not against having nominees juried. If only the American films had to go through that process! But I say, if a movie meets the other eligibility requirements (it must have at least a seven-day run in a commercial theater in LA, must run longer than 40 minutes, and must have been exhibited theatrically in a qualifying format -- eg, 35 mm film, 70 mm film, etc. ), making it eligible for all of the other awards, it should also have a shot at best foreign film if it has a predominantly non-English dialogue track. How crazy would it have been if Crouching Tiger, Hidden Dragon had been nominated for best picture but -- for whatever reason, political embargo, artistic differences -- hadn't been chosen by a jury to represent Taiwan? Cra-Zeee. But possible. Who was robbed: Okay, stepping down from that soap box, let me tell you how much I heart Japanese director Kore-eda Hirokazu. He directed one of my all-time top ten films, After Life (1998, Wandafuru raifu). 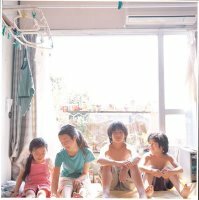 2005 saw Nobody Knows (Dare Mo Shiranai), a heartbreaking and shocking story about four children's struggle to survive after being abandoned by their mother. Yagira Yuya is luminous as the eldest boy who shoulders the parental responsibilities. If you rent the film be prepared for all 141 minutes. Well, it's time for my mid-evening nap. Like the kid in the commercial getting ready for his trip to Disney-Realm, Oscars season leaves me too excited to sleep. I'll be blogging again some time tomorrow... Oops! It's after midnight, so make that some time today. And you can also find my predictions for the major categories in tomorrow's print edition of the Seattle Gay News.